There are a variety of toy boxes for girls available. Every princess needs a toy box to store her royal subjects including cuddly toys and doll like ladies in waiting or indeed it could also be a dress up box. This Disney Princess Pretty Pink Toy Box is soft pink in color and the princess inspired design will make this a huge hit with many a little girl. Is it too optimistic to hope that picking up toys will soon be a pleasure for your little one? I know, I know! 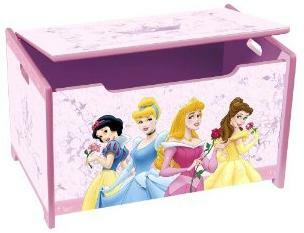 This princess toy box can be used to accessorize a princess room or indeed as a feature in a playroom. This toy box is made with a hinged safety lid to make sure that little fingers are kept safe. It also meets all JPMA safety standards. There are number of toy boxes for girls available at Amazon including this Disney Princess Pretty Pink Toy Box.